Northampton Town chairman David Cardoza has promised "good times" ahead after avoiding relegation from League Two. 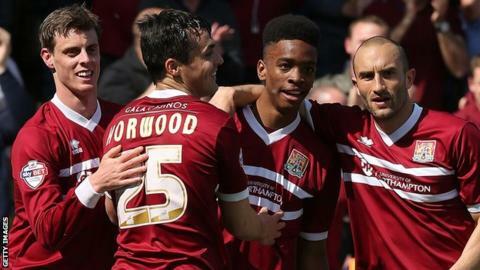 The Cobblers beat Oxford United 3-1 to survive on the final day of the season. "We look forward to next season and make sure this never happens again," Cardoza told BBC Radio Northampton. "We're hoping this time next year the fans will be on the pitch celebrating going up, not just saving ourselves from going out of the Football League for the first time in our history." Chris Wilder's side had spent 217 consecutive days in the League Two relegation zone until last week's win over Dagenham & Redbridge. And Saturday's victory over Oxford, coupled with Wycombe's win against Torquay, saw Bristol Rovers drop down to the Conference Premier. Wilder has picked up 28 points since replacing former manager Aidy Boothroyd in January and Cardoza, who is overseeing a redevelopment of the club's Sixfields ground, expects the former Oxford boss to mount a promotion challenge next season. "I'm not celebrating coming fourth from bottom," said Cardoza. "This is the first step. We've stayed up. Chris will take us forward now. We've got the stadium and good times are coming. I promise you."